I haven't written a Free From Food post in a little while so I thought I would share new discoveries with you today. 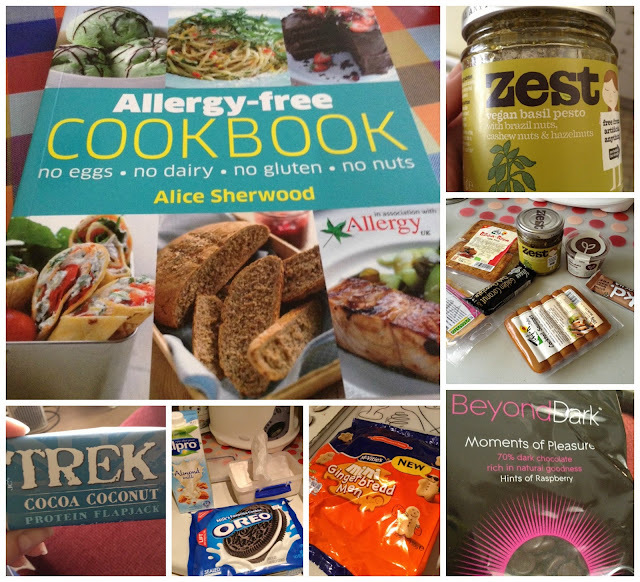 The Allergy Free Cookbook was a gift for my Sister's birthday. I found it in Marks & Spencer. It looked very good as each recipe gave you options for adapting to different allergies. I thought I would give this Zest Vegan Basil Pesto a try. I've never eaten pesto because it is not usually dairy free. Pictured below are a few other treats I picked up a my local health food store - tofu, Vegusto slices, raw chocolate mousse, nakd bar, vegan coconut bar, vegan cocktail sausages. My Tesco is now selling Trek flapjacks, the coconut one is delicious. My friend recently visited the USA and bought me some Oreo cookies. A while back I wrote a blog post about the US ones being milk free. In the picture I was experimenting adding them to a milk shake along with my Mum's homemade dairy free coconut ice cream. I found McVities Mini Gingerbread Men via a mention on Twitter. These are vegetarian, contain gluten but may contain nuts, milk & soya. Beyond Dark chocolate is dairy free. I have previously tried the plain version but these have a hint of raspberry.